For many years, we’ve received questions about sales & trading vs investment banking. Many readers are interested in both fields or don’t yet have a strong preference. In both investment banking and sales & trading, you act as an intermediary or broker. You facilitate transactions, such as helping a company raise debt or equity, or helping an institutional client buy and sell securities, and you earn commissions on those transactions. Beyond that high-level description, however, the fields are very different. Investment banking is concerned with large, corporate-level transactions such as buying or selling an entire company, restructuring a company, or helping a company raise debt or equity to pay for a major expansion or acquisition. By contrast, the transactions in sales & trading are much smaller and are placed by hedge fund and asset manager clients that want to trade stocks, bonds, FX, derivatives, and commodities. Salespeople build relationships with these clients and encourage trades, and the traders execute the trades by making markets for clients and getting them the best prices. Traders earn money from both commissions and the bid-ask spread, which is the price difference between securities purchased and sold if they’re making a market. S&T professionals help institutional investors earn money and deliver returns, while IB professionals help company management improve their businesses, expand, and adapt. For more, please see our articles on mergers & acquisitions investment banking, fixed income trading, and equity trading. You need good academic credentials, mathematical ability, and “drive” in both fields, but the required personalities and skill sets differ substantially. Investment banking favors high-achieving students who can work long hours, “grind it out” to complete deals over months or years, and make sure all the i’s are dotted and all the t’s are crossed on long documents and presentations. By contrast, sales & trading is more about quick reactions, a solid “market instinct” and the ability to assess risk and reward and make calculated bets. This explains why many athletes end up in sales & trading: similar skills are needed on the field and on the trading floor. Sales & trading is becoming increasingly automated and technology-driven, which means that computer science and math skills are more valuable there. Many products are now traded electronically, and eventually, trading will be electronic for all but the most complex and customized products. That creates an interesting mix in sales & trading, where some roles are quantitative and programming-focused, while others, such as sales, are more relationship-driven and intended for outgoing, social people. By contrast, professionals in investment banking tend to be more similar to each other at the junior levels (“nose to the grindstone” types), and little real math is required. Network via alumni or LinkedIn/email to win interviews, and use on-campus recruiting if you’re at a target school. Complete an online application, which may include items like competency questions or math/verbal/logic tests if you’re in Europe. Complete an initial video-based interview through HireVue. Then, complete a phone-based or in-person interview (this one varies and may not happen if the firm uses all video-based initial interviews). Finally, attend a Superday if you’re in the U.S. or an assessment center if you’re in EMEA. If you’re in another region, such as Hong Kong, you’ll do something in between the two. One process difference is that MBA-level recruiting is far more prevalent for investment banking roles, especially in the U.S. Some S&T groups recruit from business schools, but the percentages are far lower, and it tends to be more difficult to break into the field as a career changer. You generally do not pick a specific group upfront in either IB or S&T recruiting, so the assignment process happens along the way or when you win an offer. To have a realistic shot at an internship in either field, you’ll need a sequence of previous internships. These might be at boutique banks, PE firms, or VC funds, or in wealth management, corporate finance, or anything else that’s related. Then, you need to present that experience effectively on your resume by focusing on the 3-4 most important internships and activities. 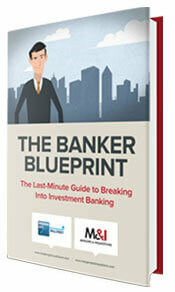 You can get our investment banking resume template here and our sales & trading template here. It’s also more important to show evidence of quantitative/analytical/math/coding skills because S&T has become more tech-driven. There is some controversy over whether or not you should list mock trading accounts on your resume. The short answer is that they tend not to be taken seriously, and you shouldn’t even consider them because you need to list previous finance internships on your resume/CV. But if you are a very young student and you have absolutely nothing else, then yes, you could list mock trading accounts or, better yet, real personal accounts and your results. The article about investment banking networking also applies to sales & trading. Do NOT bother traders or salespeople during market hours, and especially not around market open or close. It’s best to ask for informational interviews 1-2 hours after the close, or, in London, go for after-work drinks. Since the large banks dominate sales & trading, cold emails and especially cold calls won’t work as well; they can still be effective at boutiques and smaller prop trading firms. It’s slightly better to discuss work and market-related topics in S&T informational interviews because traders enjoy talking about those subjects. In an S&T Superday, you’re more likely to get a mix of interviewers from across different desks, and potentially even some who work in middle-office roles like risk management. By contrast, IB interviewers tend to come from the specific group you’re interviewing with, or at least closely related groups. Both types of interviews usually start with the “Walk me through your resume” question, and the fit questions about your strengths, weaknesses, leadership experience, and previous internships will be similar as well. IB Interviews: You’ll get questions about recent deals and your own deal experience, and the technical questions will cover accounting, valuation, DCF analysis, M&A and merger models, and LBO models. S&T Interviews: Questions about the markets and investment/trade ideas are far more important, and you won’t get technical questions about accounting, valuation, or deals; math and brainteaser questions are likely, and even coding questions could come up. You should also know a specific product, such as equity derivatives, very well. For more, see our coverage of sales & trading fit questions, sales & trading technical questions, and investment banking interview questions and answers. For sales roles, you’ll get questions about difficult client situations and how to pitch trade ideas, and you’ll be less likely to receive math/brainteaser questions. You can “prepare your way to success” in IB interviews because you need to study specific material, practice, and produce answers to fairly standard questions at the large banks. It’s more difficult to “prepare your way to success” in S&T interviews because interviewers care more about your math skills, market knowledge, and ability to think on the spot. It’s also one major reason we never ended up releasing an S&T Interview Guide. If you’re in the EMEA region, you will have to complete an assessment center instead of the Superday interview. In both S&T and IB, these assessment centers involve additional interviews, verification of online tests to make sure you didn’t cheat, group exercises, presentations, and case studies. The difference is that S&T ACs are more trading-focused, with exercises such as trading games where one group makes a market and the other buys and sells. Presentations involve investment pitches rather than advising companies on acquisitions or capital raises. You’re less likely to get report writing or e-tray/in-tray exercises in S&T ACs because you rarely write long documents in S&T, but you do so frequently in IB. That’s about it on the recruiting front. Next up are the career differences, and we covered the basics above: IB is concerned with longer-term projects such as major M&A deals and pitching for those deals, while S&T is more about the “day-to-day” of making markets and placing trades. To get a sense of an average day, take a look at the “Day in the Life of an Options Trader” article. Note that not everything in S&T focuses on short-term, day-to-day activities. For example, if you’re on the exotics desk and you create custom financial products for clients to trade, you’ll spend your time on longer-term projects. The more you do that, the more the role starts to resemble investment banking, though it’s still different because you will not work on deals involving entire companies. On the surface, the hierarchy in the investment banking career path is the same as the sales & trading one: Intern or Summer Intern, Analyst, Associate, VP, Director or Senior VP, and Managing Director. It takes a few years to get promoted from one level to the next in both IB and S&T, assuming you perform well enough to justify a promotion. However, there is one big difference: in sales & trading, the work itself does not change that much as you move up the ladder. You’ll start out assisting the traders, you’ll then get more client or trading responsibility, and then you’ll get higher and higher risk limits as you prove yourself. But even as an MD, you’ll still be trading – the job remains similar unless you move to the managerial side and stop trading (in exchange for lower bonuses). This is also true on the sales side – senior salespeople simply sell more and work with more important clients. By contrast, the work changes significantly as you move up in investment banking. Analysts and Associates do mostly grunt work, such as Excel, PowerPoint, deal process tracking, and pitch book creation. VPs spend more time on “project management” and begin to develop client relationships. Bankers at the Director or SVP level do even more of that, and at the MD level, it becomes a near-100% sales job where bankers meet executives and wine and dine them to win deals. Investment banking hours are legendary for their awfulness: Analysts expect to be in the office for 80+ hours per week, they need to be “on call” when they’re away from the office, and unpredictable pitches and deals often result in canceled personal plans. You work slightly more than market hours, coming in before the market opens and leaving after it closes. Your schedule is more predictable because you do mostly day-to-day work and do not have to stay up all night closing multi-billion-dollar deals or pitching for them. Weekend work is rare, so you can usually “unplug” for two days each week. These points have some validity, but they’re a bit deceptive as well. First off, you may be in the office for less time, but you still need to follow news and market events when you’re away. And keep in mind that some markets, such as FX, trade round the clock. Second, your hours in the office will be more intense because there is very little “downtime” where you’re waiting for people to submit comments or respond to emails. Finally, banks have implemented “protected weekends” and other schemes to give junior bankers more scheduled time off, which has arguably improved the IB lifestyle a bit. So, yes, you can have more of a normal life in sales & trading, but do not assume that the job is “easier” just because you’re in the office for fewer hours. There’s no such thing as “stability” in the finance industry, but it’s fair to say that sales & trading jobs are less stable than investment banking jobs. That happens because S&T is 100% performance-based, and it’s very easy to measure your performance: Did the client place the trade? How good was the bid-ask spread? What was your P&L? By contrast, it’s harder to measure performance in IB, especially at the junior levels, because it’s not always clear who contributed what. Just think about how everyone in group activities in university received credit even if one person did all the work and someone else did almost nothing. Even at the senior banker level, it’s harder to judge near-term performance because it might take years or decades to build the relationships required for a single deal to come together. As a result, upper management can’t necessarily write off a new MD just because he/she doesn’t do well in Year 1. If there’s a financial crisis or other market disruption, many people in both S&T and IB will lose their jobs. But outside of that, you’re more likely to stick around in IB as long as you’re not terrible, while you’re more likely to be cut for under-performance in S&T. Investment banker salaries + bonuses progress similarly to sales & trading salaries + bonuses, at least at large banks. Junior-level employees (Analysts) tend to start with total compensation in the $100K – $200K range. Then, Associates move up beyond that level, and mid-level employees such as VPs will earn a total closer to the mid-six-figure range (e.g., $400K – $500K). SVPs and Directors will move up once again, and, at the top, MDs often have base salaries in that mid-six-figure range, with highly variable bonuses that might take total compensation to $1 million+, or even the low millions – but in a bad year, the bonus could also be $0 or close to it. As you move up in both fields at large banks, the majority of your bonus will be deferred or paid in stock rather than cash (producing one big advantage for elite boutiques, prop trading firms, and hedge funds). Once you dig into the compensation data, you’ll find significant differences between the fields. First, pay for Analysts and Associates is lower in sales & trading, mostly because bonuses tend to be lower percentages of base salaries. This is especially notable at the Associate level, where a total compensation range of $250K – $400K is common for IB Associates, but significantly above what S&T Associates might earn. Also, pay is more volatile in S&T because your bonus depends so heavily on your individual and team performance. Senior traders tend to earn a small percentage of their P&L, so if a trader earns $20 million for the bank one year but only $5 million the next year, his/her bonus will fall significantly. MDs in investment banking face a similar issue, but fees earned from closed deals tend to be more stable than trading commissions because companies execute deals even if the public markets are slumping or problematic. Investment banking exit opportunities are broad and plentiful: private equity, growth equity, venture capital, hedge funds, asset management, corporate finance, corporate development, and more. By contrast, sales & trading exit opportunities include… execution trading at hedge funds and asset management firms, and maybe investment analyst roles at global macro funds. If you’re in a specialized group, such as the distressed debt desk, well-aligned opportunities like distressed credit funds or direct lending firms might also be options. The skill set you develop in S&T is less broadly applicable than the skills you develop in IB are. Salespeople gain a broader skill set, so they could, theoretically, win sales roles at normal companies, or even go into areas like investor relations or buy-side fundraising. However, deal-based roles such as private equity or corporate development would be nearly impossible without actual deal experience first. The job is much harder to automate since it’s a relationship-based sales role. It relates to a fundamental need (raising capital) that companies always have regardless of the financial market or even near-term economic conditions. Historically, IB has changed far less than S&T. The last major innovations that changed the nature of work in IB were Excel and PowerPoint decades ago – and those affected mostly junior bankers, not MDs. It’s still possible to make a solid career in an industry with not-so-great prospects, such as S&T; it’s just that it’s harder than it would be in a high-growth industry. You could also argue that if you’re more tech-oriented and you want an engineering, coding, or data science-related job, sales & trading is a good option because of the automation wave. However, if you take one of those roles, you won’t be a traditional “trader” but more of a technology employee. And the quant hedge fund and quant research routes are still viable, but, again, those are different from traditional trading jobs. 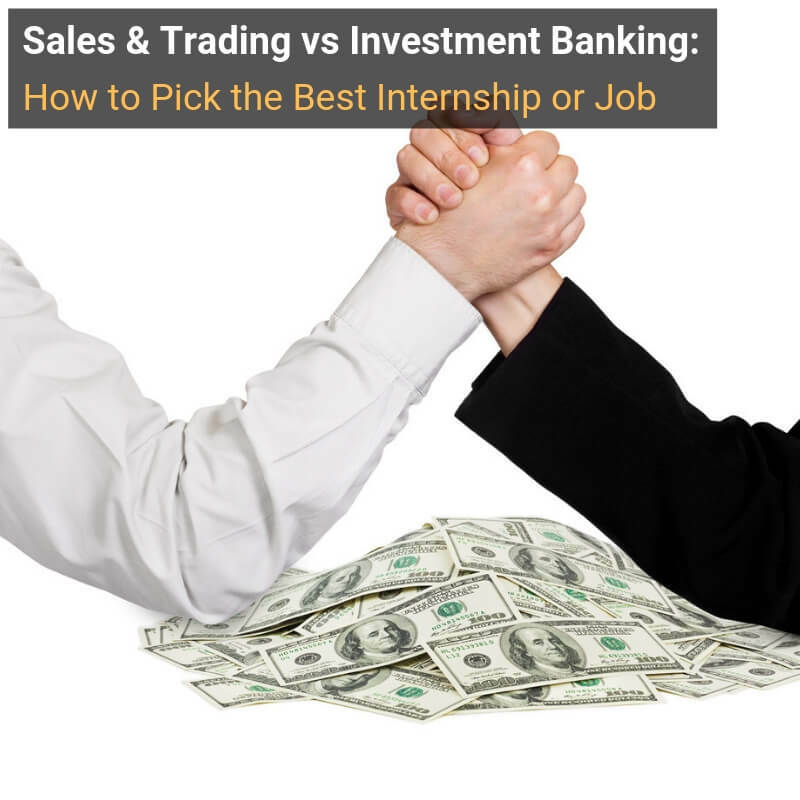 Sales & Trading vs Investment Banking: Which One’s Right for You? When we last looked at sales & trading vs investment banking, I tried to maintain a neutral tone and explain the trade-offs of each one. This time around, that’s much tougher because it’s more difficult to make a credible case for S&T. I don’t think sales & trading will go away anytime soon, but it has become more of a specialized opportunity. You’re interested in a specific product that might still produce good future opportunities because of its complexity, limited liquidity, or difficulty of automating (e.g., exotics or distressed debt). If none of these conditions is true, then I would strongly recommend investment banking instead. Despite all the changes in the industry, IB still gives you the broadest skill set and exit opportunities – even though life as a junior banker isn’t exactly a walk in the park. Viewed that way, sales & trading vs investment banking is an easy question to answer. Hi. I’m double majoring in economics and finance. I have a high gpa. I am still not sure if I want to go into investment banking or trading. I have a chance to minor in math. Is it worth it? The courses are advanced and will it really make that much of a difference if I do go into trading? I think a major in finance and minor in math would be better than a double major in economics and finance if you can change it at this point. 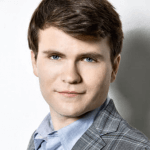 I always think math and CS classes are worth it, as long as you can maintain a reasonably good GPA, and they will be quite useful on the trading side. Ok, thanks. I am doing the double major with Econ only because it is a couple of extra classes. I think my concern was that if I go into investment banking, and eventually private equity, the math minor would be pretty useless. But what you are saying definitely makes sense. I think it really comes down to whether I want to go into banking or trading. Thanks again. Yes, the math minor won’t be that immediately useful in IB/PE, but you never know what will happen in the future. The fields might become more math-driven, or you might use the skills in some other way afterward. Also, you might be perceived as more capable if you do the math minor because nearly all bankers would say that math is more difficult than economics or finance. Ok. Thank you, Brian. I appreciate the advice. What do you know about interest rate derivatives for hedging solutions? Is it a blend between S&T and IB at a bank? Very little, but I’m not sure I’d say it’s “in between S&T and IB” – it is definitely on the S&T side, and while the products may be customized, they’re not quantitatively complex in the same way that some exotics are (for example). 1) The role is a mix between traditional sales and trading jobs because you have to multitask and monitor the markets while speaking with clients. You might be pricing options or forwards for a client, but then have to change your focus when the phone rings. 2) Lots of manufacturing and automotive clients, at least on the FX side; interest rate derivative clients are more diversified. 3) 90% of products sold were vanilla swaps, and 10% were options-related (caps, floors, and collars embedded). 4) Lots of back-testing of proposed hedging strategies and peer analysis. 5) The area is relatively niche, so the longer you stay in it, the harder it is to leave. Possible exits are Treasury departments at normal companies and maybe turnaround/restructuring roles where debt and knowledge of interest rates and hedging is important. Could exit opps include macro hedge fund related opportunities ? Yes, it’s hard to be more closely related to macro strategies than interest rate derivatives. I will be starting as an investment banking analyst at a regional boutique this summer but would like to work in PE. I understand I need to lateral to a MM or BB to have a shot, but would attempting a lateral for FT recruiting in the fall be too soon even though the start dates are for the following year? Lateral hiring works a bit differently, and the start date is usually “immediate” because banks hire you as soon as someone leaves suddenly, which happens quite a bit. I don’t think you should start recruiting for FT roles at other banks right away because you need some kind of deal experience first. But once you have 1-2 deals to speak to, you can start recruiting at other firms. The main constraint is that you should aim to move to a bigger bank by the end of your first year or so.